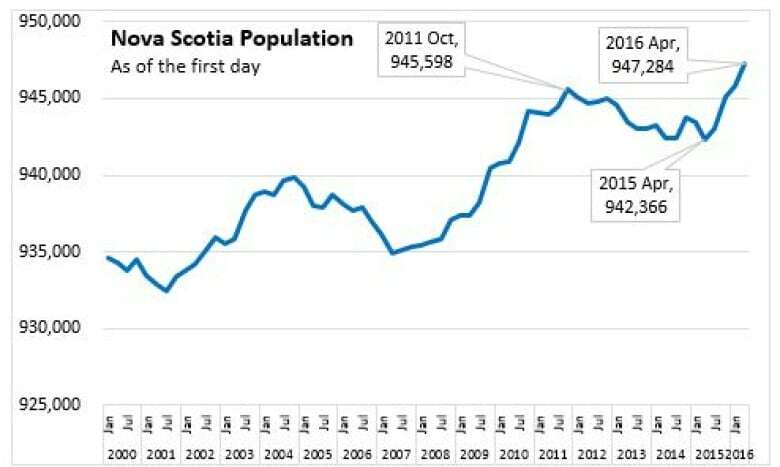 Nova Scotia's population is the highest it's ever been thanks to a growth spurt of 1,460 in the first three months of 2016, according to a new report from Statistics Canada. The Quarterly Demographic Estimates report says the province's population as of April 1, 2016 was 947,284. That is up 4,918 people from April 1, 2015. The report says the population increase of 1,460 from Jan. 1 to April 1 was the largest first quarter growth since 1985. Citing immigration as the main reason for the increase, the report says 1,849 immigrants arrived in the province during the first quarter of 2016, many of them Syrian refugees. It was the largest number on record for a single quarter. If not for immigration, the province's population would continue to shrink. The report says Nova Scotia's natural population change — the number of births less the number of deaths — continues to decline. Between Jan. 1 and April 1 there were 2,005 births and 2,543 deaths. One of the recommendations of the Ivany report was that the number of people admitted to Nova Scotia annually should be tripled.